Analysis of nine types of fungi provides evidence for evolutionary processes that have led to structural differences in a family of fungal toxins known as trichothecenes. Robert Proctor of the U.S. Department of Agriculture and colleagues from the USDA, the Rural Development Administration in South Korea, and the University of León at Ponferrada in Spain present these findings in PLOS Pathogens. Some fungi that infect plants and insects produce trichothecenes, and if present in food or feed, some of these toxins can harm human and animal health. Trichothecenes all have the same basic three-ring molecular structure, but they come in more than 150 different forms, each with different components attached to the rings. However, the evolutionary processes that have led to these different forms are not well understood. 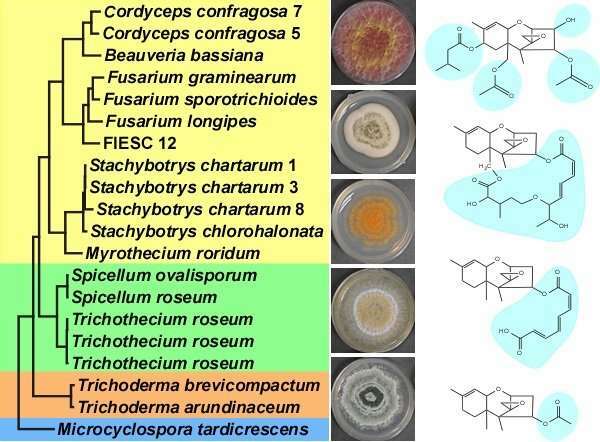 To investigate the evolution of trichothecenes, the researchers compiled genomic sequences from 14 different fungal species from nine genera, focusing on a cluster of genes involved in trichothecene synthesis (TRI genes). They also conducted analytical chemistry and molecular biology experiments; for instance, they deleted certain TRI genes in one fungus and assessed the effects of the deletions on trichothecene structure. The analysis revealed that different trichothecene structures likely arose from gain, loss, and functional changes of TRI genes as fungal species evolved and diverged from one another in their different habitats. Different combinations and versions of TRI genes are responsible for the diversity of trichothecene structures seen among species today. Some fungi have even independently gained different genes that have the same effect on trichothecene structure. The researchers used their data to propose scenarios for how genetic changes have affected trichothecene structure during the evolutionary history of the TRI gene cluster. In one scenario, a structural modification of trichothecenes produced by the agriculturally important fungus Fusarium was lost, re-acquired, and lost again through loss of a gene, gain of a different gene, and then loss of the latter gene. Just as habitat differences drove morphological diversification of Darwin's finches on the Galapagos Islands, habitat differences have likely driven structural diversification of fungal toxins. It remains to be determined what factors in the habitats have driven trichothecene structural diversity.